School of Rock Tickets are now available! 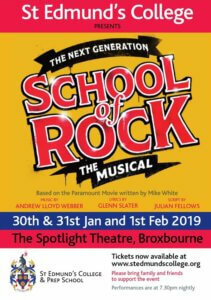 The show is again performed at the Spotlight Theatre, Broxbourne on Wednesday 30th January, Thursday 31st January and Friday 1st February at 7.30pm. This year you can make your own seat allocations so there are no worries about seating at the performance itself. We are also able to accept donations through the booking process, something we are always asked about. You can still make your donations at the theatre itself and of course, it is only if you wish. Please note that every penny raised goes towards making these spectacular shows possible and making memories that will last forever for the students.